JNN 03A terrorist attack carried out at a Kenyan college campus has ended with 147 students killed, the country’s interior ministry says. At least 79 others were wounded after Saudi Wahabi Al Shabaab gunmen stormed the Moi campus at Garissa University College near the border with Somalia, authorities said. “587 students have been evacuated from Garissa University College, 79 injured. All students have been accounted for,” The Kenya National Disaster Operation Centre said on Twitter. Speaking to reporters in Garissa, interior minister Joseph Nkaissery did not specify precisely how many students, staff or security personnel had died but said four Al Shabaab Terrorists were killed. One other suspected Terrorist was also captured while trying to flee the scene, officials said. Somali Wahabi group Al Shabaab claimed responsibility for the attack seven hours after firing on the college campus, and said it was holding Christian hostages inside. The gunmen exchanged gunfire with security forces including police and the Kenyan military, over several hours. Students who managed to escape said five gunmen wearing masks broke in on Thursday morning about 5:30am (local time) as morning prayers were taking place. “Some of us were still asleep in that mist of confusion, no-one had an idea what was going on, screams from ladies and every person, it was evident everyone was running for their lives,” one witness said. There were reports some people ran the wrong way into the direction of the terrorists while others hid in fields and inside the campus for hours. The gunmen reportedly asked people if they were Muslim or Christian. The Muslims were reportedly let go, while those who said they were Christian were either killed on the spot or taken hostage — similar to what happened in the Al Shabaab attack on Nairobi’s Westgate mall 18 months ago. Many of the people wounded were hit by gunfire and four were airlifted to Nairobi for treatment, the country’s National Disaster Operation Centre (NDOC) said. Some students have also been taken to a government facility in Garissa to be transported back to their homes tomorrow. The bodies of those killed have already begun to be transported to the country’s capital, Nairobi. The Department of Foreign Affairs said there were no Australians registered as being in Kenya’s east. The Australian High Commission in Nairobi was trying to determine whether any Australians had been affected by the attacks. There were suggestions from the international community and from the intelligence community that an attack was imminent in Kenya. Both the Australian Government and the British government updated their travel advice last week and suggested they did have intelligence an attack was being planned. 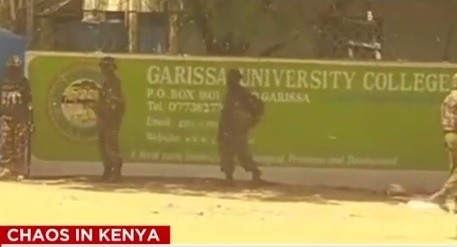 While that intelligence was not specific enough to pinpoint Garissa University College, Garissa is known to be home to a large population of Somali Kenyans and the area has been the target of similar attacks in the past, including the 2013 attack on an upscale shopping mall in the capital Nairobi. The Wahabi group claims to carry out attacks in Kenya because Kenyan troops are a part of an African union mission to try to bring stability to Somalia and have helped drive Al Shabaab out of a number of major built-up areas in the country. Last month Garissa University College’s chief security officer informed the campus it was a target and that Al Qaeda-linked Al Shabaab was planning an attack. “Some strangers had been spotted in Garissa town and were suspected to be terrorists,” she said. “Then on Monday our college principal told us … that strangers had been spotted in our college. Authorities have offered a 20 million shilling ($285,500) reward for information leading to the arrest of a man called Mohamed Mohamud, described as the “most wanted” and linked to the attack. This entry was posted in AFRICA and tagged Africa, Al-Shabaab, al-Shabab, Christian Students, Garissa University College, Kenya, Kenya National Disaster Operation Centre, Somalia, University Under Attack, Wahabi Terrorists Organisation. Bookmark the permalink.